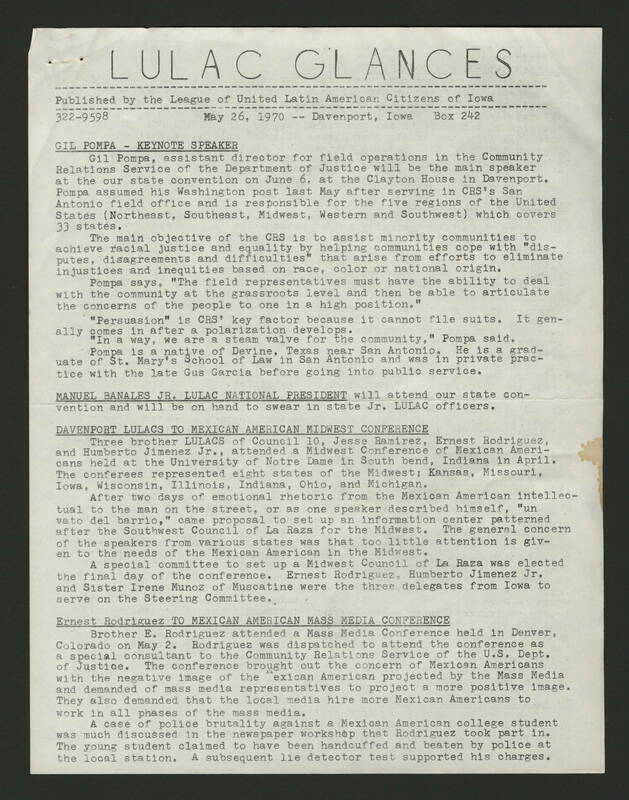 LULAC GLANCES Published by the League of United Latin American Citizens of Iowa 322-9598 May 26, 1970 -- Davenport, Iowa Box 242 GIL POMPA - KEYNOTE SPEAKER Gil Pompa, assistant director for field operations in the Community Relations Service of the Department of Justice will be the main speaker at the our state convention on June 6, at the Clayton house in Davenport. Pompa assumed his Washington post last May after serving in CRS's San Antonio filed office and is responsible for the five regions of the United States (Northeast, Southeast, Midwest, Western and Southwest) which covers 33 states. The main objective of the CRS is to assist minority communities to achieve racial justice and equality by helping communities cope with "disputes, disagreements and difficulties" that arise from efforts to eliminate injustices and inequities based on race, color or national origin. Pompa says, "The field representatives must have the ability to deal with the community at the grassroots level and then be able to articulate the concerns of the people to one in a high position." "Persuasion" is CRS' key factor because it cannot file suits. It generally comes in after a polarization develops. "In a way, we are a steam valve for the community," Pompa said. Pompa is a native of Devine, Texas near San Antonio. He is a graduate of St. Mary's School of Law in San Antonio and was in private practice with the late Gus Garcia before going into public service. MANUEL BANALES JR. LULAC NATIONAL PRESIDENT will attend our state convention and will be on hand to swear in state Jr. LULAC officers. DAVENPORT LULACS TO MEXICAN AMERICAN MIDWEST CONFERENCE Three brother LULACS of Council 10, Jesse Ramirez, Ernest Rodriguez, and Humberto Jimenez Jr., attended a Midwest Conference of Mexican Americans held at the University of Notre Dame in South bend, Indiana in April. The conferees represented eight states of the Midwest; Kansas, Missouri, Iowa, Wisconsin, Illinois, Indiana, Ohio, and Michigan. After two days of emotional rhetoric from the Mexican American intellectual to the man on the street, or as one speaker described himself, "un vato del barrio," came proposal to set up an information center patterned after the Southwest Council of La Raza for the Midwest. The general concern of the speakers from various states was that too little attention is given to the needs of the Mexican American in the Midwest. A special committee to set up a Midwest Council of La Raza was elected the final day of the conference. Ernest Rodriguez, Humberto Jimenez Jr. and Sister Irene Munoz of Muscatine were the three delegates from Iowa to serve on the Steering Committee. Ernest Rodriguez TO MEXICAN AMERICAN MASS MEDIA CONFERENCE Brother E. Rodriguez attended a Mass Media Conference held in Denver, Colorado on May 2. Rodriguez was dispatched to attend the conference as a special consultant to the Community Relations Service of the U.S. Dept. of Justice. The conference brought out the concern of Mexican Americans with the negative image of the Mexican American projected by the Mass Media and demanded of mass media representatives to project a more positive image. They also demanded that the local media hire more Mexican Americans to work in all phases of the mass media. A case of police brutality against a Mexican American college student was much discussed in the newspaper workshop that Rodriguez took part in. The young student claimed to have been handcuffed and beaten by police at the local station. A subsequent lie detector test supported his charges.